GIY loafers offering convenient slip-on design; A thick rubber sole for shock absorption in every step and keeps you grounded wherever you roam. Suit for every occasions,such as go to school, play, walking, hiking exercise; GIY loafer combines great looks and classic comfort courtesy of a generous comfort midsole and a great look that begs to be taken out for a walk. Exquisite Manual Suture with Smooth Lines, Upscale Quality are Embody in Every Detail of Manufacturing. Wear-resisting rubber sole with function of skid resistance, soft and comfortable, making the little feet lighter when walking. 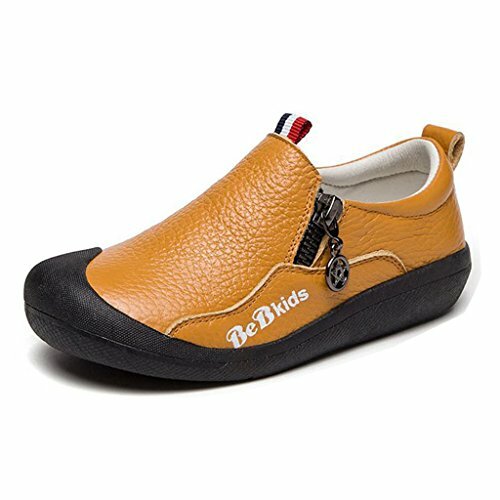 High quality flexible and lightweight rubber sole make children feel comfy, the baby walks easily, runs and plays. Let the child love walking, love sports! In order to find the fittest size,please select the size by insole lenth above,thank you!